I-IV) Clathrocanium coarctatum (Ehr. 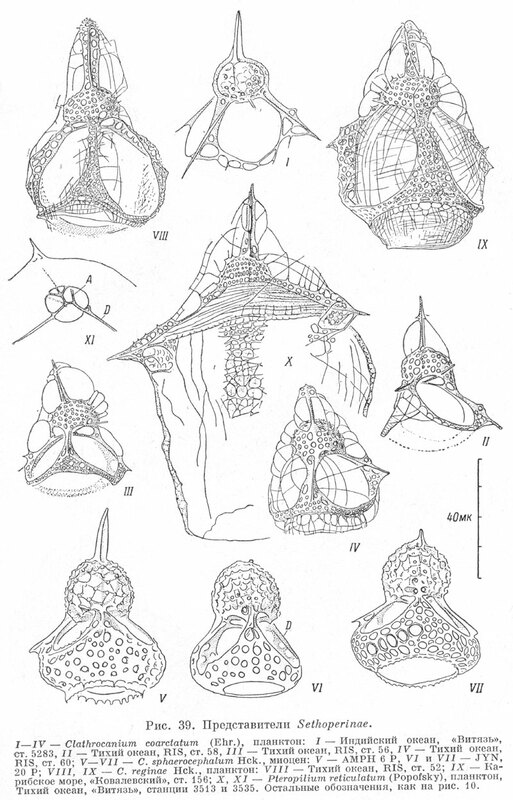 ), plankton: I) Indian Ocean, "Vityaz", station 5283; II) Pacific Ocean, RIS, station 58; III) Pacific Ocean, RIS, station 56; IV) Pacific Ocean, RIS, station 60; V-VII) C. sphaerocephalum Hck., Miocene; V) AMPH 6P; VI, VII) JYN 20P; VIII, IX) C. reginae Hck., plankton: VIII) Pacific Ocean, RIS, station 52; IX) Caribbean Sea, "Kovalevskij", station 156; X, XI) Pteropilium reticulatum (Popofsky), plankton, Pacific Ocean, "Vityaz", station 3513 & 3535. Other designations same as in fig. 10.